Watching your dog age and have trouble walking is not an easy thing. You can’t reverse the aging process, and you can’t always cure what ails your dog, but you can help take away her pain. Below are four tips on ways to reduce the pain your senior dog feels when she walks. In today’s American we often hear about obesity. Don’t think, though, that extra weight isn’t a problem for your dog. It is. In fact, overweight and obese dogs often have many more health issues than dogs who are at a healthy weight. This is especially true in regards to senior dogs. As dogs age they become less active and their metabolism slows down, and are hence more prone to gaining weight. One way to improve your dog’s mobility and reduce the pain she feels when she moves is to get her weight down to a healthy number. Extra weight puts extra stress on your dog’s heart, lungs, and joints, just to name a few. With more pressure (weight) on your dog’s joints, any joint issues your dog has, such as arthritis, become more painful. More pain in your dog’s joints means less activity, and less activity means more extra weight. 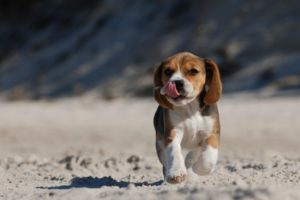 As dogs age and have more trouble walking, certain seemingly benign household things can greatly impede their movement, the first of which are smooth floors. Tile and, in particular, hard wood floors can be a great problem for senior dogs with reduced mobility. Because such floors are slick, your dog is at greater risk for falling, and she knows this. One way to help your dog with her traction is to clip any hair that grows between her toes and may cover the pads of her paw. You can also get dog booties with rubber soles. Another way to help your dog navigate slick household surfaces is to put rugs down, or the sticky mats that go under rugs. If your dog has to regularly cross the kitchen floor to get into the house, you may want to consider building her a ‘bridge’ of something like a rug. This way she can confidently and safely cross the kitchen without falling. Stairs are also a big problem for senior dogs. If possible, reduce the amount of time your senior dog has to spend on stairs. If her bed is upstairs, move it downstairs during the day, and then back upstairs at night. Stairs not only increase the likelihood of your dog falling, but they also can cause a great deal of pain to your dog if she needs to navigate them multiple times a day. Despite the fact that walking may cause pain for your dog, you still want her to walk. Activity gets your dog’s blood flowing. Good blood flow in your dog’s body means that her entire body is getting nutrients and oxygen. This means that her body can stay healthier for longer. Not only that, but there is evidence that arthritic dogs who exercise slow the progression of the disease. 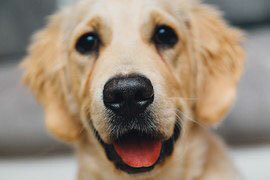 Walking won’t cure your dog of arthritis, but walking can reduce the pain she feels that is associated with arthritis. Lastly, there is the most obvious reason to walk your senior dog. Exercise helps keep your dog happy, and at a healthy weight. Your dog may be in so much pain that she cannot use certain legs. Despite this, you can still get her out there and moving. There are many companies who make dog slings, which are a series of straps and cloth, which you can attach to your dog to help reduce the amount of weight her legs bear while she walks. Obviously, your dog won’t be able to go on very long walks if her pain is this debilitating, but even a short walk can do wonders for your dog, and her pain.